George Eckley, and his sons Andrew and Aaron, wanted to kayak fishing, but found the typical 34" cockpit too small to work with their poles and tackle boxes. 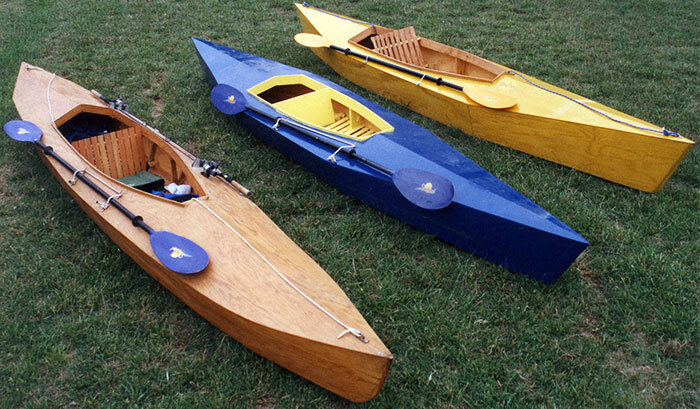 So they built their own kayaks. First they built ORIGINAL OAK, which is 14'6' long, with a 29' beam, and a 64" cockpit. It is 1/4" oak plywood, on oak frames, with an oak keel. The exterior had 6 coats of resin, and the total construction cast was $410. Their second boat, BLUE BIRCH, is 13'4" long, also with a 29" beam, and a 48" cockpit. 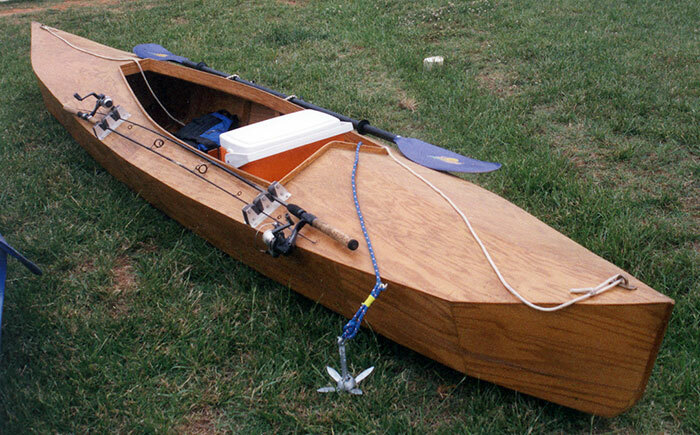 This one is made of 1/4" AC birch plywood, on 1/4" plywood frames, fir chines and gunwales, and a poplar keel. It is coated with two coats of resin, two coats of marine primer, and 2 coats marine topside paint. Its total cost was $346. Finally they built the FINE FIR, which is 13'8" long, 29" beam, and 60' cockpit. FINE FIR cost just $248 it is built of 1/4" AC fir plywood on plywood frames. White pine was used for the chines, wales, and bow and stern stems. The keel is of poplar. This boat was covered with 3 coats of resin containing a yellow coloring agent. They have used these boats at Duke Power State Park on the north end of Lake Norman near Mooresville, NC. They have planned a summer trip to kayak and fish the flat waters of east Carolina along the coast.